I love the thrill of finding a great bargain. 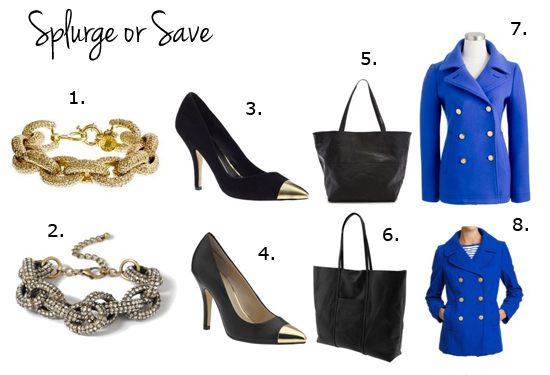 Particularly when it comes to finding affordable alternatives to pricey items that I've had my eye on. Case in point, my Forever 21 sparkling link bracelet that I wore in my last post. I put together just a small sampling of items that I've been wanting, all of which have affordable options that are nearly identical to the expensive original. Can you tell which is which? Oh I love this post Aubrey! I've had my eye on those pumps as well! great picks love! that old navy coat is gorgeous! Nothing is as good as finding yourself a bargain! Great finds!!!! Love the affordable section! thank you for this post! ive been looking all over for a cheaper version of that jcrew bracelet! Those all look so similar to each other and are great finds. Love this post! Wow, these are identical to each other. Great finds lady! These kind of posts are my FAVE! Thank you! Although...I've purchased many a shift dress you've blogged about, too. These are great picks! I was so excited when I recently found a pair of boots identical to the Rag and Bone Harrow booties! Bargains are the best! lol.... i am such a sucker.... i love a good deal just as much as the next girl but on the types of items above (ie key pieces/ shoes / jackets / bags)i always say splurge! :) Super trendy or ts / pants etc. I say save. I can hardly tell which is which, but the shoes I can see the quality difference. The coat is gorgeous though! oh I love this type of post!